Is here to help you lose weight andlearn how improved health is possible without eating less. And, how to keep those changes for the long-term. Severe heart disease has been reversed, type II diabetes is reversible, impotence can be reversed without drugs, and your cholesterol and blood pressure markers can improve with satiating and delicious diet and lifestyle changes. You can increase your energy and decrease body pain. It's all reported in the scientific evidence. I'm here to show you how to implement this evidence through our online and live trainings and healthy meals-to-go service in Columbia, SC -- Trisha's Table (coming very soon). 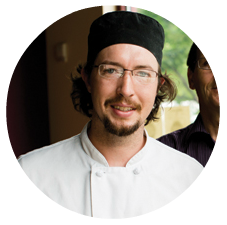 Erik Hoffman has over 15 years experience in the culinary world. He knows how to make healthy, plant-based meals taste like your grandma's Thanksgiving dinner. He's cooked for three farm-to-table eateries including Bolete Restaurant; helped open a successful Italian farm-to-table Restaurant in Bethlehem, PA, Molinari's and was the Executive Chef at The Mint Gastropub where he met his wife, Trisha. Dr. Swann Adams has received multiple awards for her research in cancer disparities and diet and lifestyle interventions. She's the Associate Director of the Cancer Prevention and Control Program, the Co-Director of the Center for Cancer Survivorship, and holds a joint, tenured associate professor appointment in the College of Nursing and the Department of Epidemiology and Biostatistics at the University of South Carolina. Dr. Adams immersed herself in the plant-based research after a type II diabetes diagnosis at the age of 44. After a Take It Back Weekend with Trish, Swann adopted a low-fat, plant-based diet and has lost 23 pounds in 3 months after 20 years of yo-yo dieting with Weight Watchers. And, her blood sugar readings are starting to hit the normal range. Dr. Adams is one of my go-to woman for understanding and researching the scientific literature for my questions and yours. Our advice and trainings are always grounded in science and Dr. Swann helps ensure it. Read Dr. Adam's full bio here and listen to an inspiring interview with Dr. Adams as she discusses the 'how' and 'why' of her diet and lifestyle change. Dr. Homertgen works at the Monroe Health Center in Monroe, Oregon, a clinic that doesn’t turn anyone away. Visits are free for those with no job and no insurance, and there’s a sliding scale for those who work, but have no insurance. Dr. Kyle is an amazing addition to the Trisha's Table team, to help you further understand the manifestations of disease and how diet can help prevent them. Dr. Kyle has a website to share plant-based resources so he can better assist his patients. Visit www.DrKyle.com to access.